Happy December! Here in Massachusetts, the weather has become decidedly wintry, and the grocery stores are full of the season’s fruits: clementines, grapefruits and, my favorite, pomegranates. In honor of that luscious fruit, and the changing season, today’s myth is the story of Persephone. 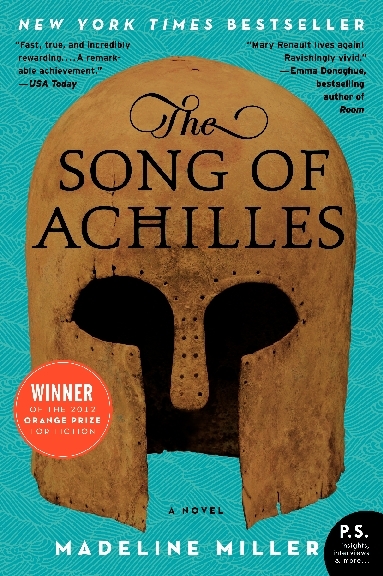 The suggestion comes thanks to the fabulous Sarah Clayton (@Clayton_Sarah), a passionate reader and advocate for books. Persephone (Proserpina in Latin) was the beautiful daughter of Zeus and the goddess of grain, Demeter. 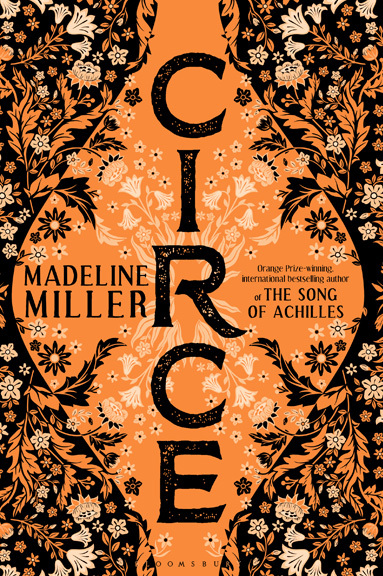 One day while she was picking flowers with her companions (Artemis and Athena, in one version of the story), Hades burst from the earth in a golden chariot, seized the girl, and carried her off to his palace in the Underworld. Persephone being abducted by Hades. Note Athena, with the helmet, trying to rescue her. Rubens. So, in snatching Persephone Hades was no more villainous than any of those other ancient abductors (Zeus, Poseidon, Apollo, etc). In fact, some might argue he was less so. 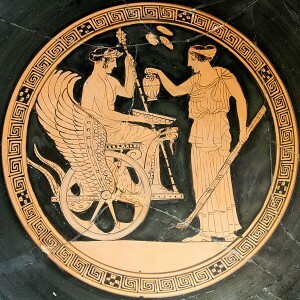 The god of the Underworld had gone first to his brother Zeus requesting a bride. 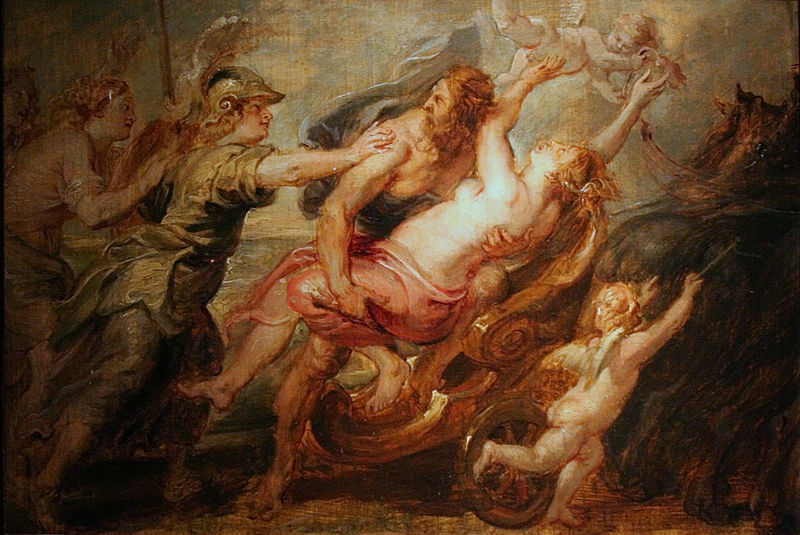 Zeus suggested Persephone and, knowing that her mother would never allow the girl to go, likewise suggested the abduction. 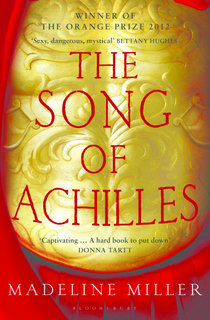 So it was with her father’s permission that Hades took the girl—as polite as it gets among divine unions. Small consolation, of course, for Persephone. 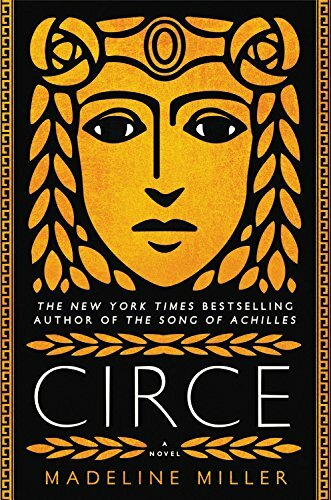 When Demeter discovered what had happened to her daughter, her grief was so great it blighted the soil, causing the first winter. In some versions of the story she even purposefully destroyed the earth, holding the world hostage until Zeus ordered her daughter returned. I like this portrait of Demeter as vengeful mother (see Clytemnestra), and Demeter’s name is even etymologically related to the word for mother (meter), so fiercely canonical was this part of her identity. 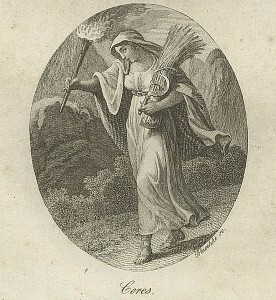 Demeter (Ceres in Latin) is shown searching the world for her daughter, carrying a torch and a symbol of her power, a sheaf of wheat. She is allowed to leave, but the seeds condemn her to return and spend a season each year in the land of the dead. Winter is born. Hermes bringing Persephone back to her joyful mother. Frederic Leighton. Sadly, Persephone isn’t given much personality in the myths, beyond that of passive victim. 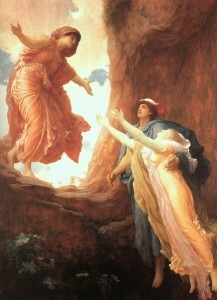 More often the tale is focused on Demeter, or the dramatic moment of abduction. In some stories, Persephone is even stripped of her name, called simply “Kore” (maiden), as though the authors wanted us to see her symbolically, rather than personally. It was in this role that she was worshipped alongside her mother in the Eleusinian mysteries, a cult of Demeter near Athens. The rituals were famously secret, but centered around Demeter and Persephone as guardians of the earth’s cyclical fertility. Persephone stands at right. On the left is Triptolemus, another agrarian deity. With Persephone and Demeter he makes up the Eleusinian trinity. There is a division at the heart of Persephone, who is at once the bringer of spring and the grim and terrifying Queen of the dead. Her story is rich with symbolic and allegorical resonance about death and rebirth. She is the incarnation of that ancient saying (supposed to make a sad man happy, and a happy man sad): This too shall pass. Persephone with her pomegranate. Dante Gabriel Rossetti. Persephone also helped to give death a more merciful face. Hades was known for being immovable, but Persephone assists a number of heroes and grieving lovers who stumble down into her world. She is the one who grants Eurydice back to Orpheus, and she likewise aids Psyche in her quest to earn back Eros. In honor of Persephone’s story, I will end with a great trick I recently learned for peeling pomegranates, without becoming your own red-splattered character from Hawthorne. Fill a large bowl up with water, submerge the pomegranate, and cut and strip it underwater. Not only will it contain the juice squirts, but the white pulp floats and the seeds sink. Much easier! Good thing I am not Persephone or it would never be spring again….